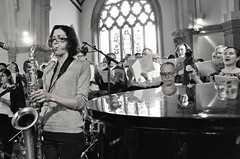 Ezra Williams and Friends, Saturday 22nd September 7.30pm. An evening of singing with Ezra Williams and opera friends, New Unity Unitarian church, 39A Newington Green, London N16 9PR. Vox Holloway performed with these singers in May this year and people thought they were terrific (oh, and VH were good too!). Here is their flyer. Amnesty International 1920’s Party, Friday 28th September. Inga from the sopranos has organised this fundraising event in aid of Amnesty. The party is happening on in the Orford House Social Club in Walthamstow starting at 7pm and finishes ~11:30pm. This year they have a mixed programme combining live Jazz by the fabulous local Jazz band “While the cat`s away” with recorded 1920`s Jazz songs played from original Shellac records. They also have the pleasure to have Floria & Warren – professional dance instructors who have trained the dancers for the Olympic Opening Ceremony as guests this year to teach the Charleston. And if you are lacking a stylish outfit why not buy your jewellery on the night from the Walthamstow Jewellery Group to add a 1920`s touch to your outfit? Tickets are only £7 (Full price ticket); £5 (Student Concessions). All proceeds from ticket sales will go to Amnesty International to support future projects to protect humans around the world. You can buy your tickets on the night or from WeGotTickets online. Amnesty Flyer. 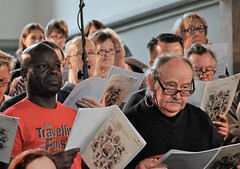 Members of Vox Holloway are being invited to join singers from two local choirs to sing in a production by Highbury Opera Theatre “Tobias and the Angel” at the Union Chapel. The performance will include 8 pro singers/actors, a 9-piece orchestra, Highbury Young Singers and other children, a dance group, an on-stage group of amateur singer/actors,and a SATB chorus. It could be you! There are rehearsals planned between now and then, for details of which please use the contact form on the right of this page. 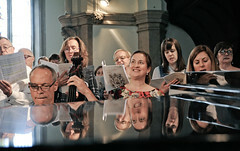 A social evening for friends, family & neighbours, with a cabaret & live band, singalong, Speak-easy listening. Music & drinks available. Pictures from last October’s Speakeasy are here. Speakeasy is looking for a jazz sax player to play standards and improvise on the night. Please contact Crispin from the tenors using the contact form on the right of this page if you know of anyone. 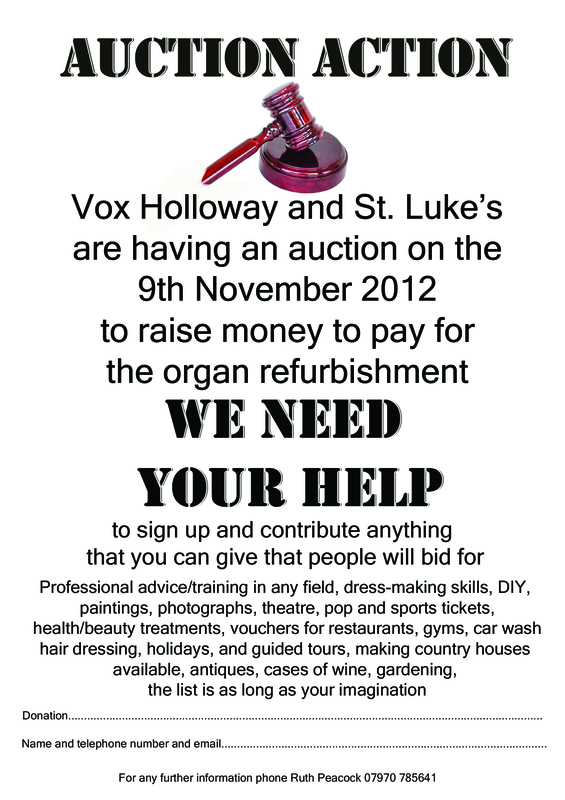 In support of the restoration of St Luke’s Organ and the choir’s community work. Dinner, wine (or beer if you prefer), entertainment and the opportunity to get your Christmas shopping done while raising money for really worthwhile local causes. Auction lots already offered include: a tour of the new BBC building in W1; a brand new Yamaha electric guitar; a private consultation with an internationally renowned biblical scholar ; Makeover with fashion journalist who worked with Trinny and Susannah; Organic Worm Liquor – a tonic for your garden; babysitting; A poem written especially for you, by a well known and popular author; catsitting…..We need you to offer lots for auction, to buy tickets for the evening, to come along with your friends and bid, and to volunteer to make it happen on the night. Any offers of help to Ruth, the Chair of the VH committe using the contact form on the right of this page, or her phone number is in the flyer below. 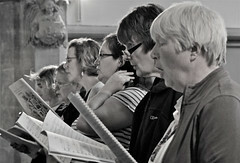 This entry was posted in Choir, Community choir, Concert, London and tagged choir, concert. Bookmark the permalink.